A court in India's Bihar state recently ruled in favour of Mae Chi Ahree Pongsai, a nun in her seventies, who lodged a complaint requesting that she be allowed to replace Phra Khru Pariyat Thammawithet as head of the Thai Nalanda temple, 90km from the state capital of Patna. Mai Chi Ahree reportedly claimed that the former abbot, Phra Maha Tharntong, who died in 2007, had written in his will that if she came into conflict with his successor, she should seek assistance from India's courts to take over. The news of Mae Chi Ahree's court success, made public following a visit to India by Culture Minister Nipit Intrasombat late last month, caused an uproar in Thai Buddhist circles. Phra Khru Suwatthanachariyakhun, vice-rector for public relations at Mahachulalongkornrajavidyalaya University (MCU), said that as the temple was in India, the court's ruling would have to stand, but the decision flew in the face of Thai-Buddhist tradition. Essential Buddhism scripts and principles clearly outline the power structure within a temple and the separation of roles between mai chi and monks, he said. ''Mae chi are barred from managing temples. Only monks, rising to the position of abbot, can manage them,'' he said. ''During the Buddha's era, there weren't any nuns. Now things have changed, and now they can stay on temple compounds. THOUGHTFUL: Thai monks lead Buddhists on a meditative walk in Kap Lung forest in Hong Kong. In the past, efforts have been made to clarify the status of mae chi, such as in 1991, when the Institute for Thai Nuns pushed parliament to consider a ''Nun Act'', which would outline basic regulations for nuns. But Mae Chi Ananta Nakboon of the Mae Chi foundation [Institute of Thai Mae Chi?? ?Thai Nun's Institute?? ?Buddhasavika Foundation??? ]strongly disagreed with Mae Chi Ahree's actions. She said mae chi can establish meditation centres and foundations and administrate them, ''but definitely not temples''. Further complicating matters in Mae Chi Ahree's case is the way in which Thai temples abroad are administered. Temples here are established as juristic entities under the Ecclesiastical Law (1962, and 1992). The temple is considered religious property that cannot be transferred to any person and comes under the authority of the Sangha Supreme Council. Overseas temples, such as the Thai Nalanda temple, are not beholden to the Ecclesiastical Law or the Sangha Supreme Council. ''Most overseas temples are established as non-profit organisations or under a foundation with or without Thai Buddhist monks at the beginning,'' said Amnaj Buasiri, director of the secretariat of the Sangha Supreme Council. That difference has led to conflicts arising between monks and foundations' administrative teams, he said. In some instances, committees overseeing temple affairs have fired monks, who have then complained to Thailand's Office of National Buddhism. ''The office has suggested that Thai monks should be named to chair foundations overseeing temple affairs, so that they can better deal with conflicts when they occur,'' said Mr Amnaj. CONTEMPLATIVE: Thai monks lead chanting at the Thai Buddha Gaya temple in Kushinara, Uttar Pradesh state, India. Phra Khru Suwatthanachariyakhun proposed that religious attaches be dispatched abroad to deal with conflicts such as those in Mai Chi Ahree's case, which he said will only increase as overseas Thai communities expand. ''The temples transferred the land and property rights of the temple compound to the Thai government, and the Thai embassy in the UK works with them to help look after the property as a national asset interest in a foreign country,'' he said. He said the proposal has been discussed among relevant authorities but without any resolution. ''Many factors, including different countries' laws and regulations, must be studied in detail,'' he said. Just to make it clear...it's Thailand and the Thai buddhist sangha that does not allow women to be "fully ordained" monks. Other buddhist traditions have agreed that women can become monks...and even rise higher up in the ranks to be heads of temples and such. In fact in Japan, China, Vietnam, Sri Lanka, and Korea there are many examples of women who became famous and respected as monks or heads of temples. It is only in Thailand...due to a series of historical circumstances that women have been barred from becoming "full" monks. Th reasons for this would take to long to explain...but in short, it has to do with the Thai buddhist sangha not recognising the legitimancy of there being any "true legitamate sucessor"....in their view...that can "legally" approve any womana as true full-fledged monk...ordained you might say. This is far from a universal (worldwide) view among buddhists. So there are women who are regarded outside of Thailand as monks and hold a high position in the buddhist hierarchy in their own countries. I, myself, as a young man met a Vietnamese nun...regarded by the locals as particularly holy...in Vietnam. If there ever was a person that you would call "holy" she was it. She seemed to glow from inside...she really impressed me. But unfortunatel I was only 21 years old...and I thought I knew everything about everything then...so I missed the opportunity to learn something from her about buddhisim at the time. Now, almost 45 years later, I'm starting to realise what I missed then. 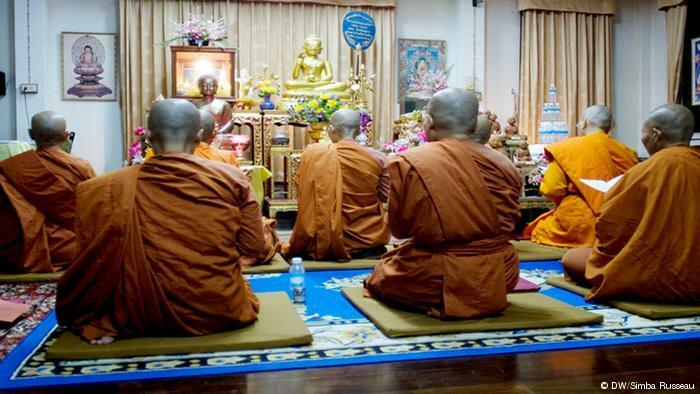 Women are barred from ordination in Thailand's Theravada Buddhist sect. After Venerable Dhammananda Bhikkhuni was ordained in Sri Lanka, she set out to elevate women's religious status in her Thai homeland. At the Songdhammakalyani Monastery in Nakhon Pathom, an hour outside Bangkok, six bhikkhunis, or nuns, dressed in saffron colored robes, begin the day with a morning prayer. Adhering to the practices of the Theravada school of Buddhism, the bhikkhunis keep a strict timetable, getting up at 5 a.m. to chant, meditate, study religious scriptures and collect alms from the surrounding villages. This temple is like thousands of others across the country, except it is the only monastery in Thailand with ordained nuns. Here, Venerable Dhammananda Bhikkhuni is the temple's abbess, or superior nun. Dhammananda is now in her late 60s. Her interest in Buddhism stemmed from her mother, who helped establish the monastery in 1960. It was the first of its kind to be built by women, for women. "This was my mother's idea," Dhammananda said. "When my mother had had enough of her lay life, she decided to be ordained." Dhammananda was 10 years old at the time her mother sought ordination - abroad. In the 1950s, Dhammananda's mother, Venerable Voramai, was prohibited by the local conservative clergymen to become a bhikkhuni, as the tradition of ordaining women had been lost in the Thai Teravada tradition. Women were supposed to lead a life as lay people, serving monks, but not become nuns. In other Asian countries, like Vietnam, Tibet or Taiwan, where the Mahayana tradition is prevalent, the tradition of ordaining Buddhist nuns had been common practice for centuries. Voramai believed nuns should engage in social service, as well as following their spiritual path. It was that pioneering spirit that inspired her daughter, Dhammananda, who initiated her career in academia but later found a different path. For three decades, Dhammananda was a professor of religious studies and philosophy at Thammasat University in Bangkok. She published books on women and Buddhism and even had a television show called "Dharma Talk," which gained national popularity and won several awards. But then her focus changed. "I'd had enough of the success," Dhammananda said. "I had enough of this worldly life. Where was it leading?" she asked herself one day with a feeling of discontent. That's when she decided to walk down her mother's path and seek ordination. Just as her mother became the first modern Thai woman to become a nun in the Mahayana Buddhist tradition, Dhammananda became the first to take Theravada nun vows in a ceremony in Sri Lanka. Theravada Buddhists there had since managed to re-establish female ordination. After her ordination, Dhammananda began promoting religious equality for bhikkhunis in Thailand. When her mother became interested in Buddhism, Dhammananda told DW, "she realized that when Buddha was alive, [he] ordained women, even his own mother." That suggests female ordination goes back some 2,500 years, to the early days of Buddhism. She began asking herself why women in Thailand had been deprived of the right. Female ordination is permitted under the current Thai constitution. But the Thai Sangha Council, a conservative religious advisory group, remains hostile toward bhikkhunis, believing only men can enter the monkhood. This underscores an already alarming gender inequality problem in Thailand. It is widely accepted among Buddhists that the Buddha established the "Four Pillars of Buddhism" - consisting of monks, nuns, lay men and women - to uphold the religion. In Thailand, however, bhikkhunis were removed from the Thai Sangha law since the word "sangha" - which means monastic community - was defined as "bhikkhu sangha." This male-centric wording thus excludes women. Despite these difficulties, Dhammananda is trying to bring about larger structural change by building a community of female monastics, paving the way for other women to ordain and be ordained. Throughout Thailand there are currently more than 30 bhikkhunis living in monasteries. In some cases women seeking ordination have been accused of impersonating monks, a civil offense in Thailand. Without legal recognition bhikkhunis are not respected by Thai authorities and are denied various benefits enjoyed by their male counterparts. "You have a hospital for bhikkhus but you don't have a hospital for bhikkhunis, and what about if a bhikkhuni gets sick?" said religious scholar, Sutada Mekrungruengkul, a lecturer at Nation University in Lampang. "Bhikkhus have their own university, but there is no university for women. Bhikkhus also receive a monthly government pension." A distinguishing characteristic of the Songdhammakalyani Monastery is that it offers women access to Buddhist education. "Since I've become a bhikkhuni I've learned to control myself, to know myself. I didn't know myself before,” said 53-year-old Dhammasiri, who was ordained four years ago. "As a former religious scholar, Venerable Dhammananda's feminist approach to religious texts is very empowering," Dhammasiri said. "Unlike the monasteries that are male-dominated, she is able to give us the Dhamma of the Buddha from a woman's perspective." 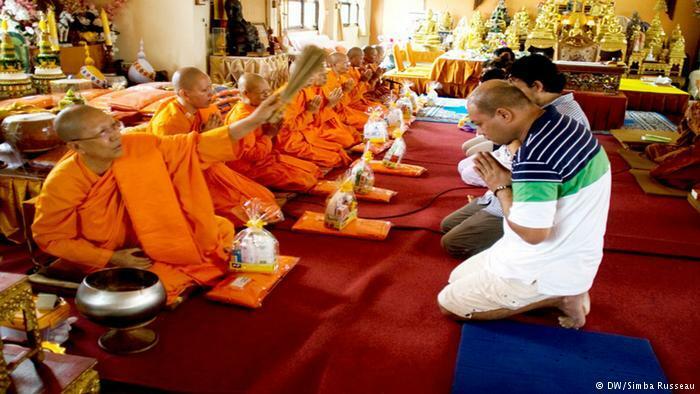 Dhammananda believes that re-establishing the bhikkhuni sangha in Thailand is a spiritual responsibility in order to maintain the Buddhist tradition. She considers being fully ordained the rightful heritage of women. "Women have always been contributing to Buddhism. And it is actually women who feed the monks," Dhammananda explained. "You go to any temple in Thailand, 80 percent of the attendants are always women, so they are actually the foundation to upkeep the goings of Buddhism in this country." It goes back to Buddhs's teachings, he only reluctantly allowed women to become dedicated followers and nuns at all. Thailand applies the Theravada tradition, which is the most 'conservative', following the original teachings as close as possible. As we all know It's never easy to break into the hierarchy of any old boy establishments same as certain golf courses and the Vatican. Assuredly, fundamentalist Islamic doctrine have an affirmed place for women. It doesn't appear be at the front. What will society think about this? Dunno, but I'm glad Thai misogyny didn't win this one.